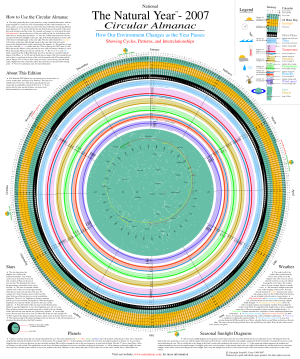 Weather data, sunrise and set, moonrise, set and phase, tides, stars, and planet motions are vividly displayed in this printable chart. Patterns, cycles, and relationships of events in the natural world become clear. Illustrates many earth science principles. The free, printable 2007 Annual and Perpetual Editions are available for download. What's so great about the circular format? How tides correlate with moon phases? When is the sun in Sagittarius? 15,000+ data points from NASA, the National Weather Service, The Naval Observatory, and other authoritative sources. Global and USA Climate Climate Charts showing average weather and daylight for thousands of locations. ChartsGraphsDiagrams.com a collection of charts about various topics. ActionPuzzles.com, a collection of simple puzzle games.